Pink Sugar Bowl: Over Ripe Avocados? Don't throw them out! Over Ripe Avocados? Don't throw them out! Last week there was a great deal at my local grocery for avocados ($1 each! ), so I bought a bunch of them! A few were ripe so those were used in my mango salsa a few nights ago. The rest I let sit to finish ripening to freeze! Most people do not realize you can freeze these whole food beauties! Just cut in half and remove the seed. Wrap in saran wrap (a vacuum sealer is the best option if you have one) then place into a freezer safe container or bag. I have never kept mine more than three months so not sure how long they will keep. When you are ready to use them thaw in the ice box overnight. These are great for guacamole, homemade baby food, chocolate mousse, truffles and so much more! I just used this bag of avocados last week. Here are some photos. Google will not allow me to post a comment or reply to any of them left unanswered! So I'm catching up on all the comments and posting this note (9/22/12). Thank you all for taking the time to submit them and all the fabulous suggestions! As you can see in the photos above only the top of the sliced half turned brown. Underneath it was still green. I'm not too picky though so it really doesn't bother me what color it is, as long as it still tastes good : ) I mostly use the frozen in raw desserts, baking (you can use to replace a fat in a recipe) and guac. I haven't had any problems at all. Only thing I can think of as to why it wouldn't work is if the freezer temp isn't cool enough. Wow! I bought 4 today for 29 cents each. Only 4 bc I didn't think I could use them before they go bad. I may stop back in the store and buy more tomorrow and try this! I do have a vacuum sealer. Thanks for the post! Where the heck do you live that they are ONLY .29??? Can you mail me some??? LOL! I get them for 4/1.00 most of the year - but this is a great idea and I'll do it for the 40 or so I have in my fridge now. Thanks! Awwww Man! Wish I had known this earlier in the year. I have two avocado trees in my yard and had a bumper crop this year. Even with giving them to food banks and neighbors a lot went to waist. Will definitely try this with the next crop. Avocados do not ripen till picked and can be left on the tree for several months - you do not have to pick them all at once. I have been price matching mine...@ walmart getting them 6 for .99 Deal!! Are they still good for salad's and sandwhichs? Personally I use my frozen avocados for raw desserts and guac. I have not sliced them for sandwiches as I do prefer fresh for those. But you could try! If you do please come back and let me know! Thank you! Where do you people live than a tiny little avocado is less than $1.50 and hard as a rock? I live in the Texas panhandle and these little delicacies are high dollar, but 'em anyway. Great tip about freezing them. wouldn't the vacuum sealer smash them? I guess if you were going to make guac, it wouldn't matter. We always have to pay at least $1.89 here near Chicago. Lucky you! I am crazy in love with avocados! I eat nearly half of one every day! I'm going to start checking Aldi now. Thank you! Sam's Club usually has a good deal on them too. I usually don't buy them there because they require you to buy six at a time. Now I can buy them! In Chicago try Trader Joe's. A bag of 4 for $3 and change. They are small but the best tasting I've ever had. And they don't get nasty as quickly as those I get in the regular grocery. Geez, i only get 2 for $5 - Haas Avocado. Milam's (Coconut Grove, FL). FYI The best time to buy Avacado's is right around the Super Bowl. I usually can get them for less than a quarter a piece then. Always check your sale ads! I am a price match junkie!! Great idea ! Also, I so glad that I'm not the only one who calls my refrigerator the "icebox" ! I eat avacados every week.. but last time I bought a bunch they went bad. My husband has put me on avacado restriction (LOL) and only lets me buy one or two at a time.. NOW I can convince him to let me buy a bunch when they go on sale! Publix has them $1 each in Melbourne, FL. But usually they are $2 each or more. where do you live people , that you can get avocados so cheap?? I live in florida ,and paid $ 2.00 each one. I'm lucky, my father-in-law has 6 avocado trees in his yard so we get them for free! In California you can usually get them for 25-50 cents each when on sale. Here in AZ we can get them super cheap too. CA Hass are the buttery ones we love. In S.CA, they are often 4 for a dollar at Trader Joes. Right now they are 4 for $.50 at Fresh and Easy. I don't think I'd ever eat them if they cost more than $.80 each. If you brushed a lemon juice on them before you freeze them, would they keep their color??? Can they be frozen whole in a sealed freezer bag? Or is there a reason you have to take the seed out? I'm wondering if they wouldn't brown if they were frozen whole...any thoughts? Leaving the seed in = not turning brown is a MYTH! If I have a half leftover, I rinse the cut side in cold water, wrap in saran wrap trying to keep as much air out as possible, and put it in the fruit bin of the fridge until I use it. It will keep nicely for 2-3 days and if it does get brown I just slice that top layer off before using. I live in NW Indiana, and my local store has a sale 12/$10. I'll have to try this!! Try spraying the cut edge with cooking spray or brush with oil before sealing tightly in wrap or baggy.Store in the fridge This keeps the cut edge from going brown for several days. they were .29 at Aldi in Indiana last week! to the person who commented around the super bowl... It was the week before. I wonder what that connection is. I thought they were just in season. They went from .29 to .59 the week after super bowl. Wow! Very good information here. They're $1.50 each in Colorado, and that's on sale! Great idea..I will try this..Maybe putting some lemon juice on the avacado will stop the browning? I love avacados and they are expensive most of the year here so when they are on sale this is a perfect way to have some guacamole when I want..So easy to do which is always nice. I was buying them at Aldo too, until I discovered some of our Mexican food stores in TX will have avocados for 16 cents each! (6/$1). It's not all the time, every few months maybe, but I had the same problem - didn't think I could stock up. I LOVE avocados and have considered growing my own tree but not sure it would survive the TX heat. Thanks for this tip, I will absolutely try! I bought a bunch and tried it with my ground beef. After a while, the air got back into the bags. I was not happy spending that much money on bags that didn't work. Do you do anything special when you seal and vacuum them? Great idea on the paper bag. I usually remove the bump that's at the base/stem. That will help ripen them faster too! A very long time ago while in high school home making class, I learned that you can place a unripe avocado in flour. It will ripen quickly, in about a day or two so check before it ruins the flour. I've been doing this for years. I would wash and dry well before putting into the flour. They ripen the same as a peach... if you place it on the counter in a brown paper bag with an apple. The gas the apple emits ripens the avocado. I put them in a paper bag with a banana. I get them for 2/1.00 or 3/1.00 quite a bit. Sometimes a 1.00 apiece. Parker, Az. do they turn brown? I tried freezing them once (not vacuumed sealed) and they turned brown. The lemon/lime juice tip works in the refridgerator too. Just coat the cut surface with lemon or lime juice and it'll stay green for several days. I do this when I put diced avocado in my daily lunch salad. I cut the whole thing up and coat the pieces in lime juice and keep it in a plastic container in the fridge so when I make my salad its ready to go, and I get a bit of zing from the lime juice in the salad too. Yes both of you are correct! The combo of lemon AND lime juice really keeps them green! However I have not done this when freezing, just in my guac and on slices. I use Fruit Fresh on my guac and avocado dishes. It keeps them from turning and won't change the flavor. I bet it would work sprinkling some when freezing. Exactly. I leave the pit in and it doesn't turn! I often use half an avocado with breakfast, save the other half for lunch. Leaving the one half with the pit on the counter until lunchtime and it's still perfectly green. Such a great tip who knew? I love finding ot about great things you can freeze! it makes buying i bulk so much better! Yes it does help esp with the price of good quality food going through the roof these days! I can't stand to waste anything! Thank you so much for sharing this. Like the others, I had no idea that avocados could be frozen. I just got back from buying my green rock, so now I'll wait for it to soften up. I love avocado slices on burgers. I love them on burgers as well! Yes they can be frozen and work very well! Awesome! I have not tried this yet but I will! In this case I would definitely top with a lemon/lime juice combo. Do you do any citric acid or straight up freeze them? Thank you Anna Marie, I had never tried this before, interesting to read the differences. I use my foodsaver. I cut it in half, put a little lemon juice on it, freeze it for a few hours, or just long enough so that when I vaccuum it down it doesn't crush it. I do the same with my Challah bread and any other delicate food, even cupcakes and cookies...works great! wow, I have never thought of doing that! I can't wait to try it...I am the only one in my house that loves avocados! Normally I don't buy them because they go bad before I can use the whole avocado! I'll have to try this. . . we have an avocado tree that bears abundantly -- sometimes more abundantly than we can eat or give away! Sometimes you can take your avocados to a neighborhood store and use them for trade. Get the other produce you need and get rid of yours. No need to go to waste! See what rate they can give you per avocado! Hello everyone! I have tried to reply individually but blogger is not cooperating at the moment! Ann - What a steal! 29 cents?! Oh my goodness! That is great! I hope you went back for more! Billie - I hope it works for you! I make sure to keep them in the skin. Amber - yes! Buy in bulk when you can! Our Trader Joe's usually has the best deal for Avocados, but our local grocer had them $1 each and I couldn't pass that up! Usually they do not go any cheaper around here! Momma got Soul - Do you remove them from the skin? I leave them in the skin or slice in the skin to make it easier to pop out of the peel when thawed? TulipGirl - Jealous! An avocado tree?! What a blessing! Extras you cannot use? Ship some to me! : ) I'll barter with whoopies! Anonymous 3 - I love them on turkey burgers! Dr. Axe's recipe is my favorite! Anonymous 4 - Great idea using the straw! I'll try that! Anonymous 5 - Yep I'm right there with you. If it isn't in a dip I'm the only one that eats them. I will have to try this! Thanks for sharing. I didn't know you could freeze avocados! This is awesome! Does freezing change the texture? Anonymous - yes I have heard that about the seed! I have tried it when freezing but didn't work for me in this instance. But great advice! Tiffany - I know I love this as I like to buy in bulk when I make a trip to Trader Joe's once per month! Emily - Yes it does change the texture some. I do not use the frozen one's to top burgers or salads but I do use them in dips, mousse, raw desserts, etc. @Annonymous 4 & PSB: To get that "vacuum-sealed" effect, you can also stick the bag in water right up to the seal. Then zip it across pushing out the rest of the air. Thanks for the great tip about avocados! Oh, I'm so glad to see this! Our local store has them on sale for 89 cents apiece. I've been in guac heaven! I'm so glad I have a foodsaver; now I'll have to load up. CherylK - thank you! I hope you'll continue to follow Pink Sugar Bowl! won't that make the avocado turn brown? the seed doesn't keep it from turning brown, it's the citrus from lime that prevents it. Hey! The individual reply is finally working! Anonymous yes they do turn a little but usually after freezing I'm using them in raw desserts, etc. Taste is still just as good. I froze another batch of them January 25th and I'm going to cut them open for another photo so y'all can see. Thanks for stopping by! have you tried using citrus juice? I did try doing this the saran wrap/bag way. Four of the six halves look OK but brown: I opened the two worst of the batch and they were dark, dark brown and gross :(. Admittedly, I did not try using citrus juice. Next time, I will do that and use more saran wrap! Yummy! I found you on Pinterest. I can't wait to give this a try! The avocados went on sale this week! Fabulous! It works wonders especially for raw desserts! Thank you for stopping by! Just in time! I bought a bunch of great avocados! Wonderful Anne! Me too! We had them here locally 64 cents each and I stocked up again! If your avocados are not ripe you can pop the little button on th side off and they will ripen in no time. Thank you Ginger! This is a tip I have never heard of! I'll try it next time I need one to ripen faster! Couldn't you just freeze the avocado whole? You could but I don't see why you'd want to. By cutting them in half first it makes removal a lot easier. Also you can portion control. If you only need a half it's ready to go! I am going to try freezing them whole...it makes sense! I think that leaving them whole would maintain their integrity, prevent any loss of vacuum(air tight) or browning issues, and if you are only using them in guac or smoothies etc, it doesn't matter if you have to scoop the meat out. BTW, I found this tip on Pinterest! Let me know how that works freezing them whole! What I like about the halves (with no pit) is that I can literally scoop them right out of the skin. I'd like to know how easy or difficult it is to slice one frozen. This method of halves you don't have to wait for it to thaw. Love this! My son has a lot of food allergies, but avocados are a bit of a staple in his diet. I always buy too many, and they go bad. I'm so excited to start buying these in bulk when on sale! Wonderful! I hope you find that this works for your family! This is one of the best tips I've found in forever! I would eat avocados for every meal if I could...maybe now I can! You are welcome! Please come back after you've had a chance to try it out for yourself! I have those bags and I use them for my meats, veggies and fruits. I bought 4 lbs of strawberries at Costco and used as much as I could before they went bad. As soon as I thought they were about to turn I hulled them, put them in my egg slicer, bagged them, pumped out the air and froze them. I was able to make 2 quart size bags out of them. Every time I open the freezer I try to think of something I can use them for because they look so delicious! They look as fresh as if I just brought them home from the store! Those baggies are ingenious! I survived for over 2 weeks, back when I was 20 and extremely broke, on nothing but the avacados that fell off my neighbor's tree in St. Petersburg, FL. Never got tired of them and I felt fine. I love that you can substitute them for the fat in just about any recipe, even baked goods. My fav. sandwich is sliced avacado, alfalfa sprouts, thinly sliced red onion, on Ezekial bread. What a story Granny Lala! They are an amazing whole food aren't they? I'd love for you to share some of your favorite avocado recipes! Let me know if you are interested in sharing on the PSB blog! Why couldn't you just freeze them whole? What if you cut in half, remove pit, and then put the two halves together and then freeze. Might save some of the "green"
You are welcome! It works great! Just made some quac with some! I have tried lime juice and lemon juice-still turn brown(with pit and without pit). Never tried freezing. I will try, but double seal them! Might help!!! I use a combo of equal parts lemon and lime juice in my Quac and it stays green! Add 1 tsp to your avocado salad or guacamole before you serve at your next party, and it will not turn brown. Add another and mix if you are going to refrigerate it and it will hold its nice green color for the next day. Sorry, 1 teaspoon of olive oil. I have never heard of the olive oil trick, thank you for sharing! I use equal parts lemon and lime juice, my quac always stays green. I'll try the olive oil one day though to test it out. I added lime juice to mine before freezing and as they thawed, they turned into brown mush. What am I doing wrong? Hmmm...I am not sure. I do NOT add any juice to mine before freezing. Some people suggested that but I do not. I've been waiting to photograph the last batch I froze on Jan 25th when I wrote this post. I want to show what mine look like. I'm sorry that happened! : ( Those I freeze I typically turn into raw desserts, guac, etc. I still prefer fresh to top my veggie burgers. I have been buying them halved and frozen already but I love your idea. This will be a lot cheaper. Have you ever thought about freezing them a little on the unripe side. It helps with the shelf life when you are thawing. Also you can freeze them already mashed and in portion control. Yes I sure have! I first did this when some were getting too ripe and I didn't want to throw them away. But when they went on sale for $1 each recently I froze some while still firm. I haven't thawed those yet but thinking they will be good. Yes, I did mash and freeze when I made my daughters baby food, which is one reason I thought freezing the halves might work. P.S. Where do you buy them already frozen in halves? I bet it would be cheaper to do on your own but I haven't seen them here where I live! The thought to freeze them never even crossed my mind -- OMG, I love you so much right now! lol Thank you! You are welcome! I hope you try it and it works for you! I hope that this does not sound dumb, but when I cut the avocados in half and take out the seed, do i also take the outer shell off or leave it on? Thanks so much for a repy. I remove the seed, yes. I do not peel them. If you look closely at the photo you should be able to see that the skin is still intact. Honestly I have never frozen them without the peel, nor have I frozen with the seed! If you try either will you come back and let me know how it worked? Thank you for stopping by! I live near Palm Springs, CA and our Cardenas is having a sale this weekend....best deal on avocados I've ever seen: 6 for $1. Even living where avocados are grown they are still usually $1 each, so this is a SUPER deal and you can be sure I am going to be stocking up and freezing a LOT of them. What's more is if they run out, you can take the ad to Walmart and get them there for the same price =). My local market had avocados at 5 for $1 this week. I stocked up! Thank you! This is brilliant!!!! Yikes, if $1 each where you live is a great deal I hope I never move there!!! They were $0.74 at Walmart about a month ago, but I ad matched using the sweet deal from a local Latino market and got them 4/$1!!! I bought 18. Oops! I divvied them up between my brothers so we could eat them before spoiling. Now I'll be freezing them! Good to know! When I'm able to find ones that aren't gassed (they are gassed to ripen them) I will buy some and freeze! Thanks!! Why couldn't you just wash them unpeeled and freeze them to keep the air from turning them and you wouldn't need a vacuum seal, right?? Peal when you need them. Great to know! Don't be jealous, but one of my daughters purchased them for...........TEN CENTS each! (in the middle of Kansas, even!) They have a fantastic locally-owned store in their college town (Checkers) and the owner keeps the price low as well as being a fantastic supporter of town projects! I have an avocado tree in the yard, and have hundreds of avocados twice a year. Thanks for the post, just in case we can't keep up! For those wondering how to speed up ripening, place them in cardboard cupholders (like from Starbucks) and place some bananas in the side spaces. This prevents bruises on both and speeds the ripening. Since I recently introduced my friends to chocolate avocado cake with avocado buttercream, I can't make enough. That cake sounds delicious!! Would you mind sharing the recipe? you could put them in the freezer until somewhat frozen to keep them from squishing when using the vacuum sealer. I used to freeze my green beans on cookie sheets & then pour into freezer bags so that I could just pour out what I needed. Those of you growing avocadoes...where are you? I live in zone 8 and would love to grow them if they will grow here!! Please let me know! Can you freeze the avocado's whole or do they need to be cut in half before freezing? Love this, didnt know you could freeze them. I would like to know this as well. If they freeze well whole then you won't have woory about them turning brown. I been to a local Mexican market that has them for $1 each, but they are soft. Giant Eagle had them during Cinco De Mayo for $1 each for large Haas Avacado's. Now they are selling them for $1.79 each. Two weeks ago Kroger had them for $1.00 each so I bought 10. Sam's Club had them for 5 for $4.95 about a month ago. Now they are 5 For $6.95. So I haven't bought them for 2 weeks (Kroger) and I ate my last one about 4 days ago. I'm going thru withdrawel. My 10 month old granddaughter was introduced to them when she was 7 months old. She love's them. I just cut them in half, pit them, and sprinkle with lime juice. Slice them and eat till gone. Weird...their usually $1 here always...and when they're in season some stores sell them from 2-6 for $1. Thats when I stock up, otherwise I'm so stingy and don't really care to spend $1 on 1. If you drizzled them with lime or lemon juice before freezing, it might prevent the browning on top. Such a timely tip (found you on pinterest)! We are living in South America and avocados are a staple here in Chile. In fact, just yesterday, we had a little girl going door-to-door selling bags of them to raise money for a class trip. We already have 4-5 but really how can you say no to kids at your door? So we bought a kilo. They are all ripe and ready and we can't eat them that fast :) I'm totally going to try freezing them. Awesome suggestion. I see that they do brown slightly, but once mashed up into a dip - you'll never know. BTW: We get them incredibly inexpensively here. I'll hate to pay $1 a piece when we get back home. They aren't nearly as good either! Tried this. Not impressed. Definitely can't use them sliced or cut in chunks but even a guacamole the taste is watered down and not the flavor i love from avocado's. Wont be doing this again. Im very lucky. My husband grows them at his work and we can have as many as we like. In so saying they do sometimes go bad before we can eat them and i had never thought of freezing them. Where i used to work we used to mash them up to use them and at the end of the day tightly wrap the mashed avocado in glad wrap/ cling wrap/ plastic wrap, not sure what you call it there,,,im in australia:)and it was fine the next day, a little brown but mixed in it was fine and no difference to taste. Aldi's has them this week for $0.49 each. Store your uncut avocados in the fridge, they will keep for weeks, even if they are soft . The #1 natural food in the world. Glad I found this tip. I'd been wondering for a while if there's a way to extend the life of this fruit! I just picked up 10 avocados for $0.29 each yesterday, so I'm definitely giving this a try. I'll probably go back for more. We love avocados, so stockpiling this food sounds like a great idea to me! Foodfresh or lemon juice before freezing would keep them from browning. Also, if you're only using a fresh half at a time, leave the seed in before you wrap and refrigerate. It'll keep it from browning up. Great idea frozen avocados. Here in the South of France you can have one for 0,65 cents and sometimes less. This is a FANTASTIC idea! I love stocking up when there are bargains to be had and sometimes I am disappointed that I can't buy more because I can't eat produce before it goes bad. I am going to try this! Hey, folks, don't forget smoothies. Put any or all of an avocado into a blender with milk, vegan milk of any kind, cinnamon if you want, other fruit if you want, a little sweetener, maybe a little acid, greens if you like green smoothies, whatever, & it makes a delicious drink. For breakfast this morning I just blended a small avocado with about a cup of coconut milk, 8-10 chunks of fresh pineapple, maybe a teaspoon of honey, one leaf of kale. I just Googled this site because last week our favorite grocery store in southwestern MI had its annual "Pumpkin Night," when it offers unbelievable prices on a few select items, with limits to the number any one person can buy. The limit of 48-cent avocados was 24, so I had to buy 24, & I'm not looking for ways to keep them as they ripen up. Good to know I can whiz some up & freeze them. There are only 3 of us here to consume them! This seemed like a great idea, I did this and they stayed green, but unless using for guacamole, they are mushy and my family would not eat them. I get mine for around $.29 each as well. It's a store called WINCO. I love that store! Thanks for the great idea. I know it sounds funny but I am getting tired of eating all my avocados before they go bad. I have always used lemon juice once I cut them but wondering how to store them longer is definitely something worth seeking out. I love avacados, and I freeze everything else, now I can freeze my favorite fruit. We get them here 4/1.00, but usually on sale. Have you ever tried using avacado as a spread, like mayo? sometimes i use cream cheese with it too. Delicious. Here is Wasco, Ca. Near Bakersfield. Hey Man With Appetite--We have Foodsco and Winco here in Bakersfield.I shop there a lot. Can you use freezer bags? Thank for post, will give a try.. I always have the problem of getting an avacado craving and going to the store to get some, and none of them being ripe! I will have to try this. My favorite thing to do with an avacado is cut one in half, take the seed out, squeeze lemon and/or lime juice into the indention of where the seed was, sprinkle some lemon pepper and pepper onto it, and take a spoon and enjoy! The spot where the seed was makes it easy to keep the juice contained and the avacado itself makes a great bowl! No need to slice onto a plate. Awesome idea! Avo's are currently $3.60 here so next time they are on sale I'm stocking up!! This is wonderful news! :) I've let so many go bad it makes me sick.! I will definitely try freezing them.Thanks for sharing! Smart and Final here in San Diego has sold frozen Avocados for years. Freeze them with their shells off and rub with lemon juice. Should turn out a little better. Right now you can get them at Aldi for .19!!!!!! WOW, huh? LOL. What a fabulous deal!!!! 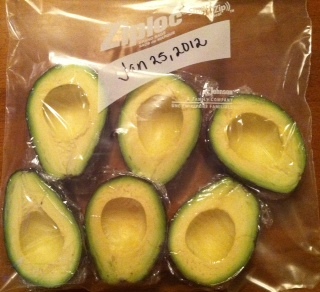 When I find a good sale on avocados, I mash them, place 1/2 cup in each zip lock, just press out excess air and freeze. I like to throw the chunk frozen with my vitamix smoothie as a good source of MUFAs...makes me feel satisfied much longer too. I cut my avocado in half, remove the seed, fill the hollow with some chilled consomme or beef broth, grab a spoon. Fast, easy & yummy! I actually tried this 2 weeks ago. Before I froze them, I brushed the exposed flesh with lemon juice. I am pleased to report they NEVER turned brown! Has anyone tried to dehydrate them? My sister and I have been trying to figure away to prolong the life of avocados, and dehydrating has come up. What do you mean "thaw in the ice box overnight"? Isn't that statement contradictory? Please elaborate. I live in Nevada...we get avocados at the Mexican market 6 for $1...small, but really good...I like this post.